Shinny, curvy, and tall. If there were any words to describe 970 Denny Way, those are it. 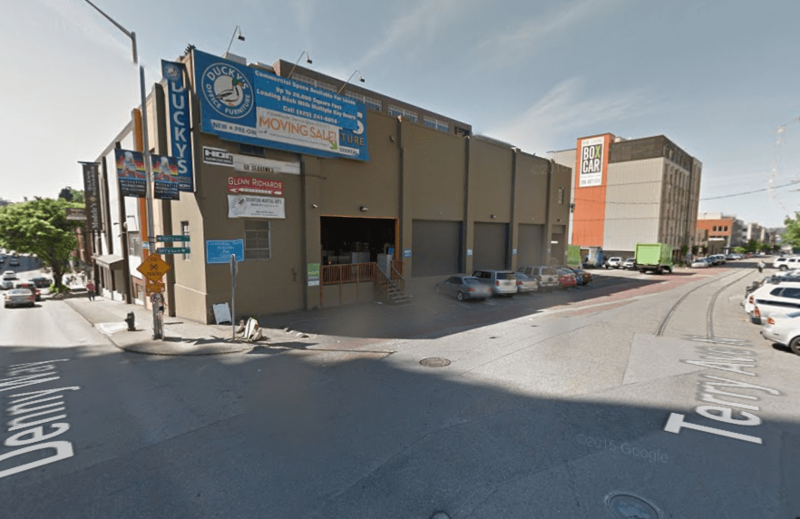 Holland Partner Group is planning to transform nearly a full block of Terry Avenue in South Lake Union. Coming in at 40 stories, a new tower will take center stage in the redevelopment project hemmed in by two modern masonry structures. 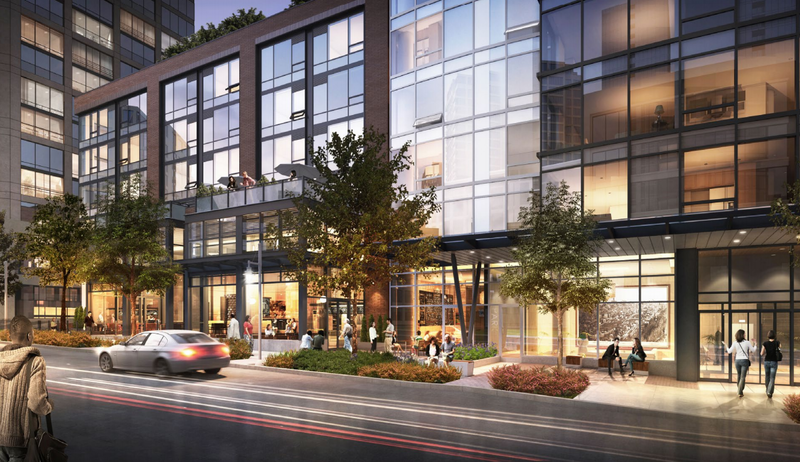 Up to 468 apartment units varying in size are planned to enter the burgeoning Seattle rental market, in addition to 15,000+ square feet of retail space. 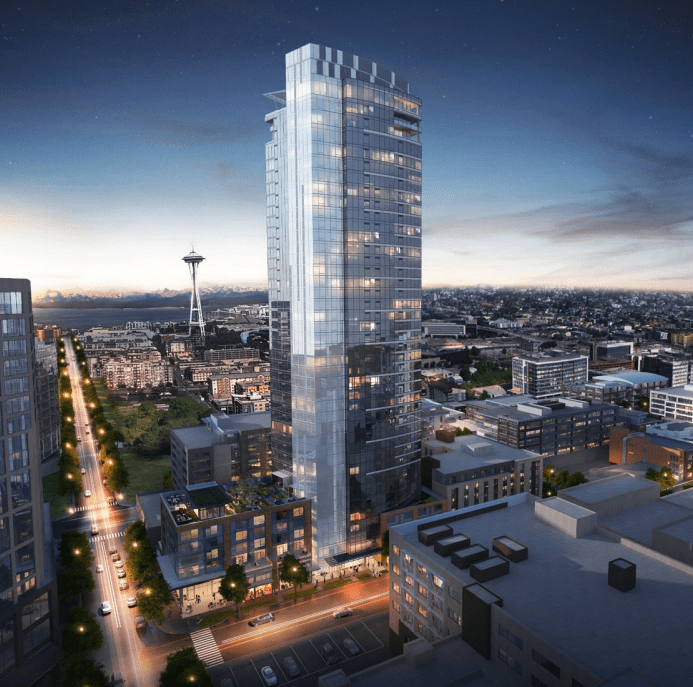 Rendering looking toward Elliott Bay. Holland has tapped Weber Thompson, a Seattle-based architecture firm, to design the project. Their approach has been a mix of the modern and classic. The tower uses a very contemporary design which is partially blocky, partially curvy, and very shinny. Rising up from the podium, the tower features horizontal and vertical banding or stripes across the facades. For instance, on the west facade, the horizontal banding varies in length; sequentially these consist of one long band followed by two short bands. Sticking with the detail, the architects have also played with vertical banding that stretch to deeper depths of the structure. Meanwhile, the curtain wall is formed almost entirely by tinted glass with blue, grey, and silver-white tones. Corner rendering of Terry Avenue and Denny Way. Flanking the base of the tower, two structures appear very distinctly from the tower itself due in part to their scale, but also their materials. The first four to six floors of the structure are planned to act as the podium. Weber Thompson has chosen a combination of materials that emulate the classic. By way of maroon brick framed with quality blackish-grey metals, the boxy structures give a very industrial feeling — one that feels timeless despite the modern fenestration between. Beyond that, the structures deploy other contemporary elements like cantilevering over a corner entry at Terry Avenue and Denny Way. Using this design tactic, the architects have provided opportunities to show off structural columns, wood paneling ceilings, and truly varied transoms along above retail spaces. Rendering highlighting small terraces above Terry Avenue. Podium rooftop garden above podium structure. And while the podium will certainly form the most important active part of the project, it will also serve as a place of privacy and refuge for residents. Intimate terraces will dot the edges of the podium structures and a rooftop garden will be located on the Denny side. Plans show a greenhouse-esque shelter for residents to hold parties, meetings, and cookouts in a temperature-controlled space in the midst of what almost seems to be a labyrinthine patchwork garden. Hidden within this patchwork garden are alcoves, which present a very real opportunity for residents to find themselves lost. No doubt the spaces with the best view of Elliott Bay will be coveted on those days with sunny Seattle sunsets. Terraces at the top of the tower. And yet, the architects have managed to up the swank factor on this project with a rooftop terrace. 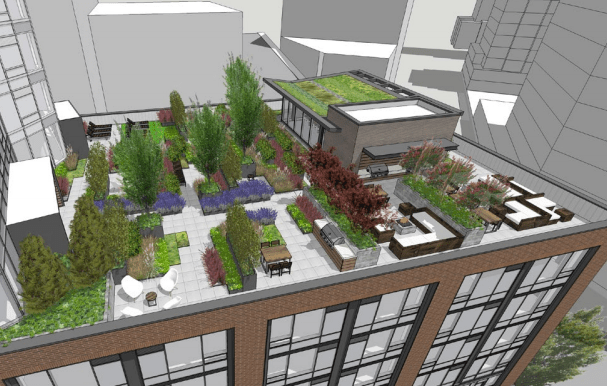 Renderings show an amenity space that will be both inside and outside. The largest share will be allocated to indoor spaces for private events, communal cooking and dinning facilities, and leisure while the smaller outside space will offer ample seating. 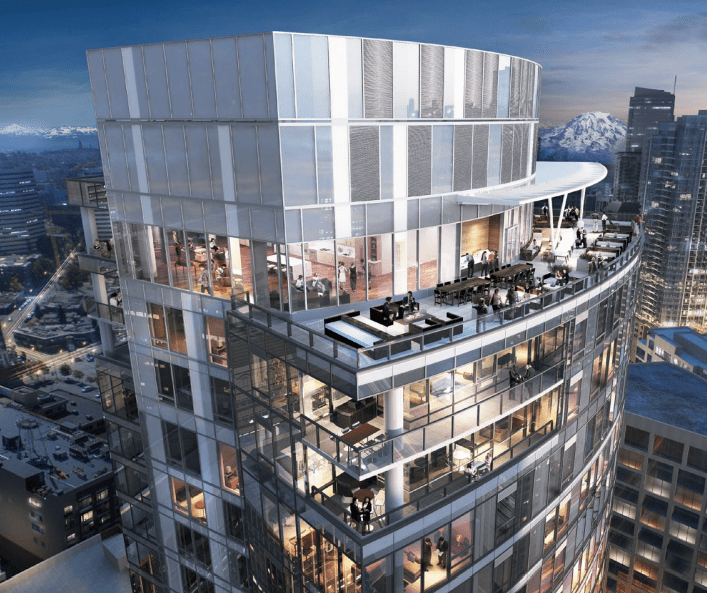 With uninterrupted territorial views of Lake Union, Downtown Seattle, and Elliott Bay, the rooftop terrace is an unparalleled feature of the tower. But it’s also worth discussing the past and what this project won’t deliver. The site was previously home to Ducky’s Office Furniture, a local commercial retail supply store that relocated to South Seattle last summer in anticipation of property sale and redevelopment. The building now lies vacant, but has stood on the property since 1927. Cast in concrete, the unassuming building is one of the last remaining warehouses in a district that was once filled with industry. As recently as the 1980s, freight trains even ran past this block on railway tracks, which are still visible in the street. In a March, Holland closed on a sale of the 14,400 square foot site for $20.1 million (nearly $1,396 per square foot). 970 Denny Way site in May 2014. And now, it’s only a matter of time before the history of this block disappears completely. The warehouse will soon be demolished in order to make way for redevelopment, leaving only a few more buildings of a similar period remaining — namely The Seattle Times across the street. Perhaps more importantly though, the project will result in the partial removal of Terry Avenue’s old railway tracks and bricks during the reconstruction of sidewalks and on-street parking. Holland is not required to retain either of these historic features under neighborhood streetscape guidelines. 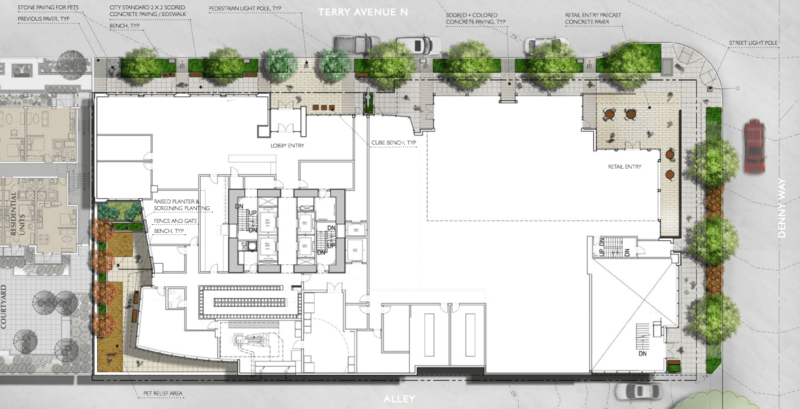 Plan view of streetscape improvements. And yet, recognizing that redevelopment will come to the blocks of Terry Avenue, these very guidelines are built upon the values of historic preservation through the one medium that the public has full control of: the public right-of-way. The streetscape guidelines go to great lengths in describing ways to build curbless shared spaces, water features for stormwater, landscaping best practices, material choices, and more as part of district redevelopment. They also explicitly encourage the preservation of Terry Avenue’s bricks by reusing them in the street, sidewalk, or art, wherever feasible. On the flipside, the guidelines are insistent that the old railway tracks be must removed from the street — a goal that appears to be in conflict with the stated intent of the document. For those who value the long-lived history of Terry Avenue, the project here may be a somewhat sour outcome. But it’s important to remember that places are far more complex and dynamic than what kind of paving that their streets happens to have. 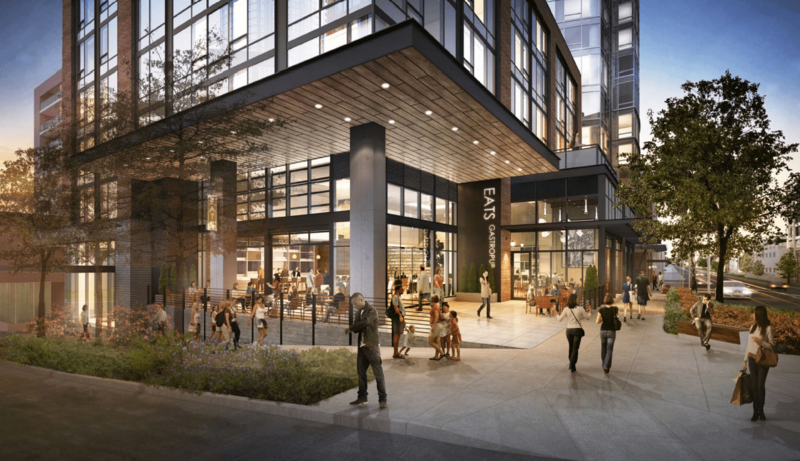 The project will present a very real opportunity to re-envision what a modern South Lake Union is becoming and what is treasured by the growing community. Is it just about bits of brick and abandoned track? Or is it also about the heavily ridden tracks of the streetcar, thousands of new towering residences, and opportunities to engage people? If you’re interested in attending the community design review meeting for this project, you can do so this evening. The East Design Review Board will meet at the Queen Anne Community Center, Room 1, located at 1901 First Avenue W. The design review meeting will begin promptly at 6.30pm. Alternatively, if you wish submit comments in written form, you can do so by e-mailing Garry Papers, Project Planner, at Garry.Papers@seattle.gov and the Department of Planning and Development (DPD) at PRC@seattle.gov. For more design review materials and upcoming meetings, see DPD’s design review page. The removal of the tracks is about bicycle safety. They may be a nice history piece but they hurt like hell when you forget where they are and take the wrong street. I agree, I think it is good to see them go. Terry is an unusual street. The old brick and rail makes it seem like a bit like Pioneer Square — an interesting place to walk, because it looks so old compared to much of the city. But I am probably not alone in saying that I rarely walk there. It always felt like like an alley (still does, to a certain extent). The lack of a traffic light at Denny didn’t help things either. In other words, whatever historical charm that street had was ignored by the city for a long time. If not for its use by trucks (much like an alley) I think it would make a very good bike path. Add a light at Denny and Terry, then you could have an excellent bike path, all of the way to Olive. Very few car go along here because it is blocked off in places. Even with the trucks, I think a bike path could work, and work well. Vehicles travel very slowly on Terry, and it is wide enough in parts to add a bike lane, and simply quiet enough in others to work really well. There have been discussions of putting a crossing there, but there are concerns that doing so would be problematic given the steepness of Denny and light spacing. Adding another one could make the intersection dangerous for drivers and those powered by foot. The City is exploring a potential “hillclimb assist” midblock at an adjacent site to link the park and offer a better way for pedestrians over Denny. Although, this project will improve the north side of Denny for the pedestrian experience. I agree the street here at Terry is a peculiar one, but that’s it’s charm, isn’t it? There are ways to retain that, but improve it for all users. 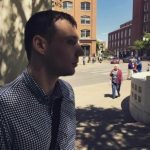 If you look at the guidelines link, you’ll see some options that the City had examined in the past.